Note: Self-Supporting Towers are limited in Height due to the nature of Antenna and Ice loads versus the Cantilever Nature Of Wind against them, offset by the weight of the Foundation and the cohesive of the soil to counter Tower tipover, as well as the strength of the tower members to withstand these Forces against them. ROHN Tower Kits are designed based on assumptions made regarding Windspeed, EPA (Antenna Load), Height, Standard Soil Conditions, Surrounding Environment and Duty. The Pre-packaged Kits contain the parts called for based on this Stock Design. The Stock Design of these Kits does not account for the Variations of Historic Windspeed, Number of Antenna(e) Loading at Specific Height(s), Soil Engineering recommendations, Adjacent Structures, Communications Purpose, or Geo-Political Rules, Laws and Codes That will be Applicable to Your Project. 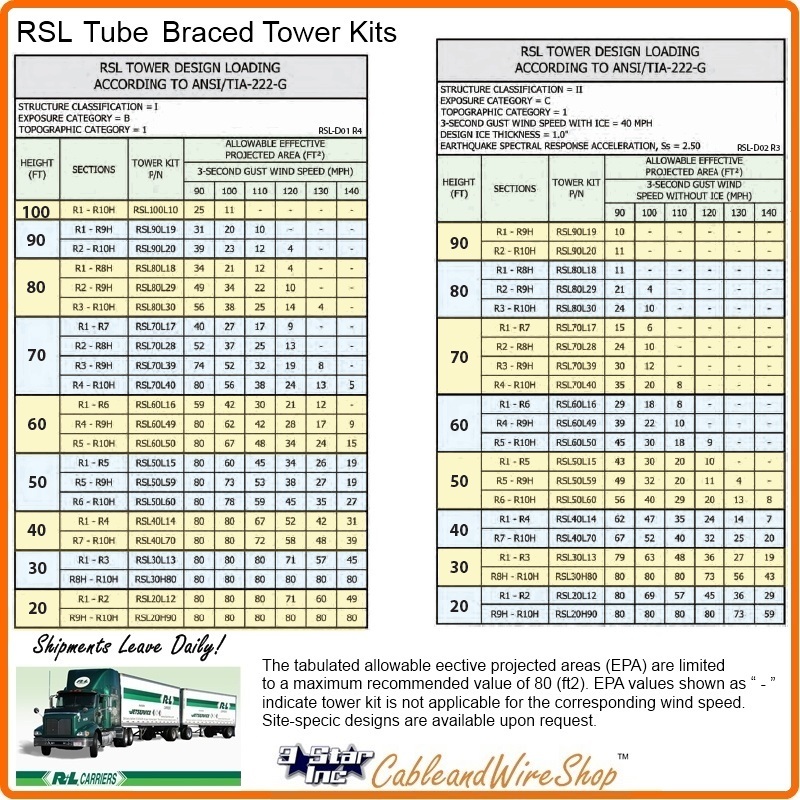 It is Recommended that you take the time to engage an local Engineer that has the expertise and available Information necessary to evaluate the Stock design for Applicability, and/or find the Tower Quote Data Sheet Form by clicking the link that appears on the Footer of this Page Below. *Per Rev G requirements, any structure greater than 10 ft requires a climber safety device. The ROHN RSL is a light weight self-supporting tower designed for use in broadband, public safety and security applications. The RSL reaches above line-of-site obstacles such as tree tops, hilly terrain and buildings. The RSL is shipped knocked down to reduce shipping cost and time. That due to height, use or location poses a low hazard to human life and damage to property in the event of failure and/or used for services that are optional and/or where a delay in returning the services would be acceptable. Urban and suburban areas, wooded areas, or other terrrain with numerous closely spaced obstructions having the size of single-family dwellings or larger. Use of this exposure shall be limited to those areas for which terrain representative of Exposure B surrounds the structure in all directions for a distance of at least 2,360 ft (800 m) or ten times the height of the structure, whichever is greater. No abrupt changes in general topography, e.g. flat or rolling terrain, no wind speed-up consideration shall be required. No representation is made for this model. The tabulated allowable effective projected areas (EPA) are limited to a maximum recommended value of 80 (ft2). EPA values shown as " - " indicate tower kit is not applicable for the corresponding wind speed. Site-specific designs are available upon request.